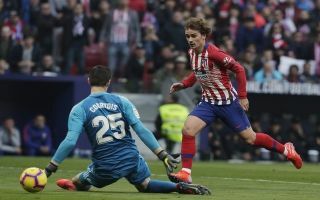 These Real Madrid fans slammed Thibaut Courtois for his poor goalkeeping after Antoine Griezmann scored for Atletico Madrid this afternoon. Just ten minutes after Real took the lead in the Madrid derby, thanks to Casemiro’s wonderful acrobatic effort (see it here. ), Antoine Griezmann equalised for Diego Simeone’s men in superb style. After a Atletico counter-attack, the Frenchman embarrassed Courtois by slotting the ball through his legs. Courtois rushed off his line, in an attempt to make himself big (he’s already 6ft8) but in doing so the Belgian left his legs wide open and Griezmann wasn’t going to turn down this opportunity to get one over the former Chelsea stopper. Unfortunately, Courtois being nutmegged is quite a regular occurrence, the Belgian just can’t find a way to stop this from happening – especially when he’s on the big stage. Courtois hasn’t had the best start to life in Madrid since joining from Chelsea last summer and many fans are surprised to see three-time Champions League winner Keylor Navas play deputy to the Belgian after his poor form. Courtouis is a joke ..
Courtois spread his legs a country mile to make himself big. Griezmann just popped it between them. COURTOIS GETTING NUTMEGGED AGAIN ??????? ?